You have six pairs of underwear, five top, four socks, three pairs of shorts, two dresses, two skirts, two pairs of shoes, one jacket, and a one plan for the ultimate summer getaway. But when we’re talking about packing for a jet set to a summer destination requiring all the prim and pampering, we’re talking extreme packing. Even after you narrow down what you absolutely need for trip, it seems our luggage still need reinforced zippers to contain its bulging and over packed items. The option of carry-on is becoming a lot more attractive, especially when a pretty price tag is added to checked luggage these days. But is it possible to travel with only carry-on? Absolutely! Most airlines allow each traveler one carry-on item and one personal item. By traveling carry-on, you can save yourself some extra cash to splurge and half an hour of airport security checking. By following these simple steps, you will fly through airport hassles straight to your getaway. Whether it’s an extended weekend to California or a seven-day trip to the mountains, all your essentials (depending on liquid mass or other dimensions) should fit in a carry-on. But before you fly, take into account the weather, your activities, the length of the flight and your style. Are you willing to sacrifice your fab faux coat for cooler weather when a smaller and just as cozy one would be just as good? Can larger items be made into travel-size items (think face wash, shampoo, conditioner, etc.)? Take into account your accommodations and if they have complimentary toiletries. Also coordinate with your family or friends, so you’re not bringing the same thing and can share (think toothpaste, lotion, etc). It is crucial to have the right carry-on luggage in order to find out what does and does not fit. Carry-on luggage with wheels is ideal because you don’t have to carry what you carry-on. Rule of thumb to remember: your luggage should retain the same dimension as it would if it was empty, and a bag should not cause you to stumble from airport security to your flight gate. This is great advice for maximizing your space and probably the most important tip for eliminating wrinkles in your traveling wardrobe. All your tops, pants, and dresses should be rolled tightly and neatly. As you place them in your luggage, be sure they do not unravel. 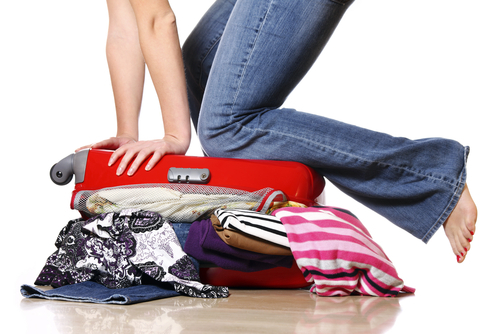 Place shoes, pants, shorts, and sweaters at the bottom of your luggage because they are most dense. Remember, if it is a piece of luggage with wheels, the heaviest items should be placed in the near the wheels so they don’t move. Next, place your shirts and blouses in your bag. As it starts to fill, put in toiletries and other items besides clothes near the top because they may need to be brought out for screening. Finally, place your undergarments, swim suits and socks in the spaces between the items. They may go in your shoes if need be. Now that your bags are packed and your plans are set, the only thing you will have to worry about is spending quality time with your loved ones at your perfect summer getaway.